Are you sure your patient has a subdural hematoma? What are the typical findings for this disease? Subdural hematoma (SDH) is an intracranial hemorrhage into the potential space between the outer (dura mater) and the inner (arachnoid mater) membrane of the brain. SDH occurs in children and toddlers most commonly as a result of inflicted head trauma (shaken baby syndrome) or from traumatic falls or accidents. The head trauma results in either venous or arterial bleeding that forms a crescent-shaped hemorrhage between the dura and the arachnoid membranes. SDH usually is caused by rupture and bleeding of the bridging veins. The slow venous bleeding often is stopped by intracranial pressure (ICP) or as clotting occurs. Symptoms have a slower onset than those of an epidural hematoma (EDH). SDHs are categorized as acute or chronic SDH. Clinical signs may present immediately, within minutes, or be delayed as much as 2 weeks. The head CT shows a hyper-dense collection on the surface of the brain. Surgical indications are less definite than in EDH and are not necessarily correlated with lower morbidity or mortality. Because the most common cause of SDH is child abuse, a history of trauma may not be reported, making evaluation difficult. For this reason, physicians must remain suspicious in children less than two years old and take note of any unusual bruising or other signs of abuse. Common parental concerns include altered mental state, seizures, apnea, breathing problems, or sudden cardiopulmonary arrest. Nonspecific clinical signs of a child who has suffered abusive head injury include irritability, vomiting, bulging anterior fontanelle, increased head circumference, pallor with anemia, lethargy, coma, or seizures. In patients with non-accidental head trauma, SDH is usually associated with seizure, confusion, headache, vomiting, or loss of consciousness. Bradycardia and changes in pupils are late symptoms and associated with very poor outcomes. Epidural hematoma (EDH) and subarachnoid hemorrage (SAH) should be considered in patients with a history of head trauma or with symptoms and signs consistent with an intracranial hemorrhage. Classic symptoms of an EDH include initial decrease in consciousness caused by the actual trauma, followed by a symptom-free interval. CT imaging typically demonstrates a biconvex and hyperdense lesion restricted by suture lines, often associated with a midline shift. SAH may present with variable symptoms. The characteristic features include a severe and sudden-onset headache, often described as “the worst headache of my life”. The headache may be associated with a brief loss of consciousness, seizure, nausea, vomiting, or meningismus. On CT scan, blood is apparent in over 90% of the cases if imaging is performed in the first 24 hours. SDH is caused by a ruptured blood vessel or direct cerebral cortical bleeding, resulting in hemorrhage formation between the brain and the dura. The disrupted blood vessel is usually a bridging vein connecting the brain’s surface to the dural venous sinuses, but tearing of small cortical arteries can also result in SDH. This bleeding can occur anywhere along the surface of the brain, but is most likely at locations of higher convexity where gravity will enhance the separation of brain and dura. Blood vessel rupture can also result from low cerebrospinal fluid (CSF) pressure. A CSF leak will decrease the buoyancy of the brain, thereby causing more friction and traction of the subdural blood vessels, making them more prone to damage. Although abusive head trauma is the most common cause of hemorrhage, in non-accidental head trauma cases, predisposing illnesses include bleeding disorders, treated hydrocephalus, arachnoid cyst, osteogenesis imperfecta, and glutaric aciduria (type 1). SDH can also occur in neonates after vacuum extraction or forceps delivery and adolescents usually after motor vehicle collisions. SDH in infants and children is rarely accidental; thus, careful examination for signs of abuse must be conducted. Early suspicion and diagnosis of abuse may allow protective intervention to prevent further harm to the child by his/her caretakers. Supplementary laboratory testing such as a complete blood count, serum chemistries, coagulation studies and a toxicology screen should be conducted. Skull fractures, skeletal fractures and retinal hemorrhage, cutaneous bruising and associated injuries in other organ systems may accompany a SDH caused by abuse. A lumbar puncture and CSF examination should also be performed to test for xanthochromia and/or red blood cells. 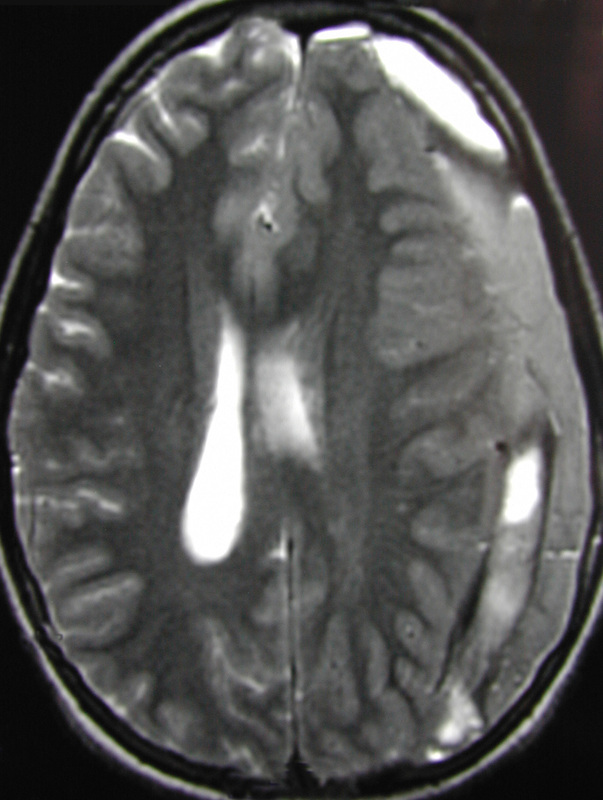 A head CT scan can reveal in brain and bone windows the presence of a SDH as well as possible signs of abuse (Figure 4,Figure 5). Unilateral or bilateral subdural hemorrhages that are diffuse, thin-layered, appear down the falx and/or over the bilateral cerebral convexities are characteristic of head injury sustained from shaking (with or without impact). The CT shows the subdural hematoma with different densities to suggest the acute and subacute nature of the hematoma. 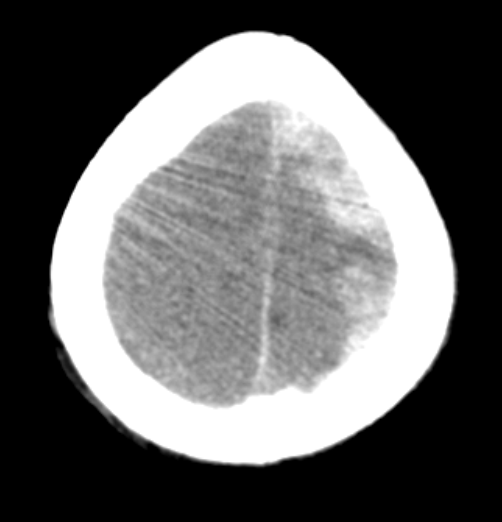 Another CT slice shows the size and the extent of mass effect from the subdural hematoma. Blood from a SDH is usually resorbed in time. However, in some cases, the hyperdense blood becomes a hypodense fluid that may grow in size within a few days or weeks. The presence of chronic collections of this hypodense fluid suggests prior abuse. Figure 3). For instance, brain MRI can determine the presence of clinically silent SDH in term neonates due to birth trauma. However, very rarely do these cases require intervention. T1 weighted axial MRI demonstrates the high intensity signal of the subdural on the left side. This spans the hemisphere and is effacing the gyri. Axial T2 weighted image demonstrates the subdural with different signal intensity. This signifies a hematoma in different stages of evolution. Axial T2 weighted image shows the subdural, but also demonstrates the mass effect on the ventricles and the shift from left to right. Children with SDH should be evaluated for inflicted head trauma if the caregiver cannot give a plausible history for the injury mechanism. For the clinical evaluation of the level of consciousness, the Glasgow Coma Scale (GCS) is determined; in children of 2 years of age or younger a pediatric GCS is used. A rapid neurologic examination with pupillary findings, cranial nerves, and motor function is essential. Common symptoms include altered mental state , seizures, apnea, breathing problems, and sudden cardiopulmonary arrest. Non-specific symptoms include irritability, vomiting, bulging anterior fontanelle, increased head circumference when compared with growth chart or prior measurements, pallor with anemia, lethargy, coma, or seizures. Signs for abuse include retinal hemorrhages, skull and skeletal fractures, unusual bruises, bruises in various stages of healing, cigarette burns, and injuries to the genitalia. An emergent head CT should be done, and supplementary laboratory studies (CBC, PTT, PT, INR). Lumbar puncture is contraindicated if SDH is suspected. Once the child is clinically stable, a funduscopic examination by an ophthalmologist and a full radiologic skeletal examination should be obtained in all children if head trauma creates suspicion of child abuse. Any concern for abuse must be reported to appropriate child protective authorities. If you are able to confirm that the patient has a subdural hematoma, what treatment should be initiated? Children with a GCS of ≤8 or rapidly worsening mental status should be intubated and ventilated to maintain a pCO2 between 35 and 40 mmHg. Supplemental oxygen is given to keep oxygen saturation over 95%. Fluid resuscitation should be provided when necessary to prevent hypotension. The cervical spine should be immobilized. If there are signs of herniation and increased intracranial pressure (ICP), hyperosmolar therapy should be given and the head elevated; if children are not responsive to hyperosmolar therapy, they should be mildly hyperventilated. Signs of increased ICP are altered mental status, seizures, pupillary changes, and vomiting. Signs of transtentorial herniation are headache and altered level of consciousness, followed by pupillary changes; bradycardia is an early sign in children. Signs of foramen magnum herniation are downbeat nystagmus, bradycardia, bradypnea, and hypertension. Coagulopathies may be treated with vitamin K, protamine sulfate, fresh frozen plasma, platelet transfusions, or clotting factor concentrates. There are no definite criteria for surgical intervention. Most children with acute SDH presenting with neurological signs and radiographic evidence of a midline shift should undergo surgical evacuation. Children with SDH not eligible for surgery should be monitored closely for neurological changes by specialized personnel. If the GCS is 8 or lower, the patient requires continuous intracranial monitoring of ICP if the medical situation allows the intervention. Because the patients can deteriorate rapidly at any time, prompt imaging and surgical intervention should be available at all times during the first 24 hours. Children are periodically imaged to monitor evolution of the hematoma. SDH or subdural hygroma may persist in some children. Measurement of the head circumference is effective for monitoring newborns. When the SDH is resolved, children may participate in contact sports again. Abused children and their siblings require psychological and social support. For children with residual neurologic deficits, occupational and physical therapy is indicated. If the child suffers from iron deficiency anemia from blood loss, replacement doses of iron may be given. What are the possible outcomes of subdural hematoma? The outcome depends on the neurologic state and GCS on presentation; neurological impairment and altered levels of consciousness typically portend a poor outcome. The prognosis for EDH is generally better than that for SDH. Compared with SDH, EDH is less likely to be associated with underlying brain injury; therefore, a patient who initially presents in coma can have an excellent outcome if rapid surgical evacuation of the EDH is performed. Most victims of child abuse with SDH have a poor outcome. Those who survive have both short- and long-term neurologic, behavioral, and cognitive consequences. SDH predominantly affects children aged less than 2 years. Approximately 8% of neonates delivered at term develop SDH, often after vacuum extraction or use of forceps. SDH under these circumstances usually remains asymptomatic and resolves after several weeks. The incidence of SDH in children younger than 2 years is 13 cases per 100,000 child-years. The most common etiology is inflicted head injury. On the other hand, motor vehicle collisions and other forms of unintentional head trauma are the major causes of SDH in older children. In addition, patients with coagulopathies, osteogenesis imperfecta, and glutaric aciduria type 1 are more susceptible to developing subdural hematomas after experiencing minor head trauma. SDH usually develops after injury to veins or arteries. The bridging veins are likely to rupture when the brain is violently moved within the rigid skull, and the shearing effects of the white matter on the grey matter initiates bleeding. In adults and in children with closed cranial sutures, the increased ICP may induce brain herniation and death. The most important prognostic factor in SDH is the type of injury; the size of SDH is less important in determining outcome. Subdural fluid collection replaces the clotted blood over time, and an outlining membrane forms after approximately two weeks. An MRI may be performed to look for interhemispheric hemorrhages, hemorrhage in multiple sites, or different densities. If there is probable cause for abuse by history and clinical presentation, these findings may confirm the suspicion. How can subdural hematoma be prevented? Because SDH most often results from head trauma, prevention depends on efforts to reduce the frequency of abusive head trauma and of head trauma resulting from motor vehicle accidents, bicycle accidents, and other causes. Public health messages to parents highlighting the dangers associated with shaking infants, laws that require car infant car seats and proper placement of infants and young children in motor vehicles, and laws requiring bicycle helmets have all been important in reducing the frequency of head trauma and SDH in infants and children. Proctor, MR, Barrow, MC, Batjer, HH, Loftus, CM. “Neurosurgical aspects of non-accidental trauma in children”. Textbook of neurological surgery: principles and practices. 2003. pp. 1065-71. Teasdale, G, Jennett, B. “Assessment of coma and impaired consciousness. A practical scale”. Lancet. vol. 2. 1974. pp. 81-4.